Nostrasantissima wonderful black, 4 button, cut-away style coat, as good as it gets, if not better. Elegant stylish and stunning! Notched collar. 2 angled side pockets. Raw edging throughout. 2 level cuffs with stitch detail and raw edging. Articulated arms. 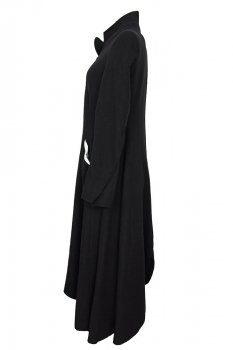 Each side is curved and is hugely generous in size, giving a wonderful drape. Angled seam with raw edges at the rear. Fully lined in white cotton. 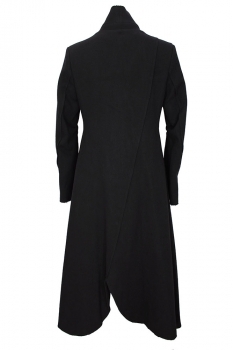 This coat is magnificent, beautifully tailored and styled and generously sized. Most highly recommended!